We will be planting flowers and plants in the front of the Church as a service project during our Pack Meeting on Friday, June 5. Please bring your gardening tools (gloves and trowels especially). Representatives of The Brickman Group will be helping us, but we need a few more parents with “green thumbs” to help us with the planting project. 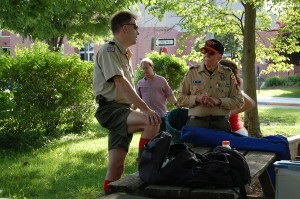 If you can help supervise the Cub Scouts who will be planting, please email me as soon as possible. 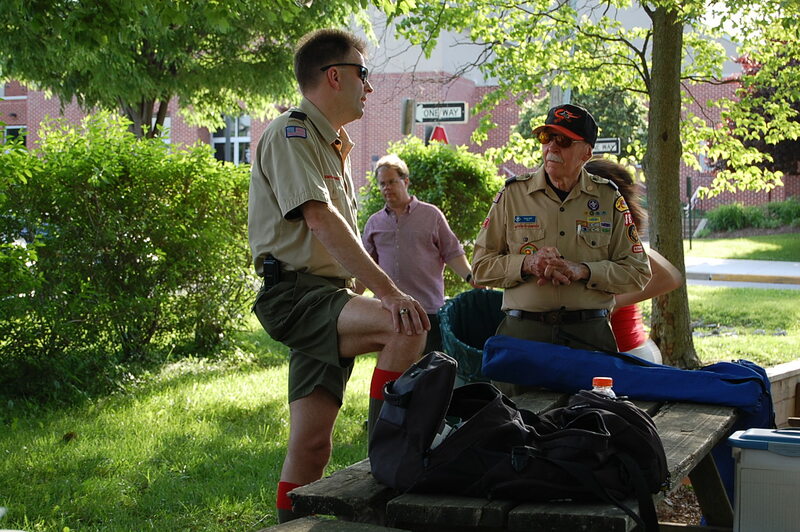 Take your family out to Twin Kiss for ice cream on Tuesday, June 2 from 6 – 8 PM and support Cub Scout Pack 883! As with our other restaurant fundraisers, the Pack will earn a percentage of the sales from that night, so invite your extended family, friends, and neighbors. Be sure to wear your uniform! 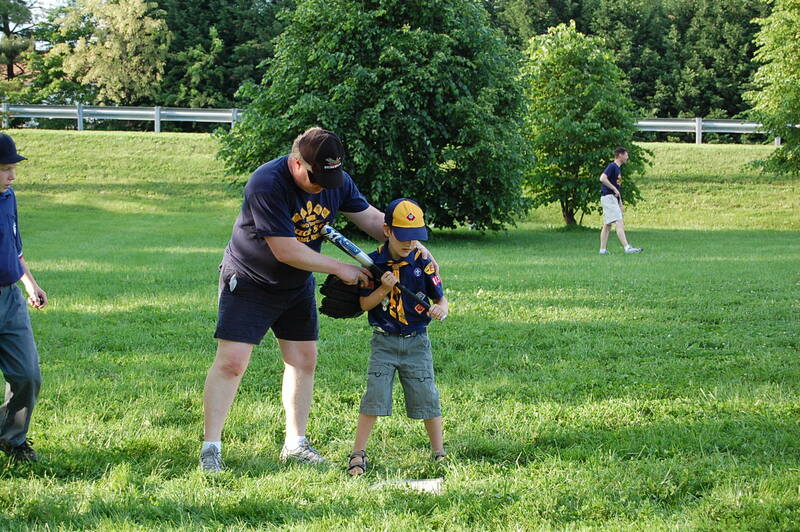 Looking for an easy way to help your son’s Cub Scout Pack? We need a volunteer to replace Barb Jermann as our Restaurant Coordinator. It’s an easy job – schedule a monthly restaurant fundraiser, promote it within the Pack, and collect the check from the restaurant. If you are interested, please email Marc Fischer at marc.fischer@transwestern.net. 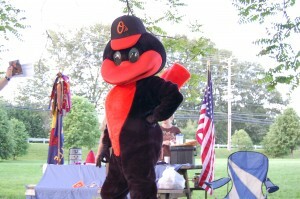 Oriole Bird Visits Pack Meeting! 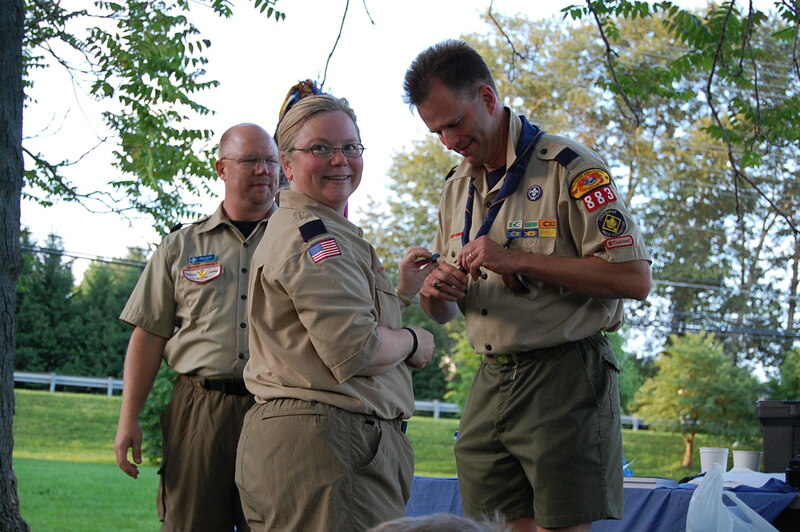 Cub Scouts from Pack 883 were quite surprised to have an extra pair of hands…er, wings as the case may be…to hand out the awards at our May Pack Meeting. 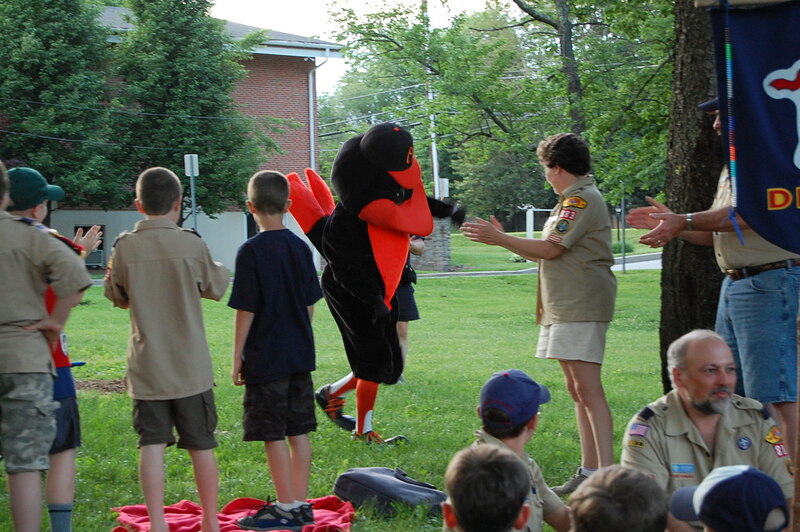 As a special surprise, the Oriole Bird showed up at our baseball/softball themed Pack Meeting on May 23 – and the Cub Scouts are still laughing. Before the meeting, the boys played softball and earned the Softball Belt Loop (thanks to the coordination of Dean Carroll and a host of parents) and feasted on delicions ballpark food (prepared by Cindy Knies and her team of cooks and helpers). 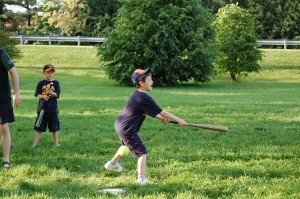 Former Cub Scout (and current den chief) Ben Carroll wore his umpire uniform and called balls and strikes. We recognized the tremendous contribution of outgoing Committee Chair, Mark Crampton, and welcomed his replacement, Diane Wolf. Mark has served Pack 883 in a variety of roles for the past 10 years. Then, the Oriole Bird flew in to joke around with our Scouts and their families – and to help present the advancement awards for this month. The Scouts learned pretty quickly that it was good thing to have an Orioles hat on…and not a good thing to have a Tampa Bay hat (right, Mr. Ray?). Thankfully, there were only a few Red Sox fans…and no Yankee fans…in the crowd! Photos from the meeting are in the Photo Gallery! 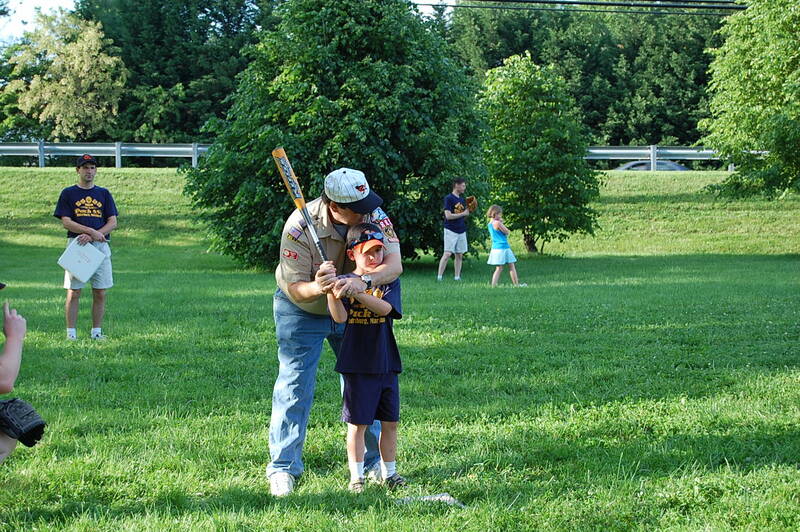 Join Scouts from all over the area for a night of baseball and camping fun. Come see the Frederick Keys play the Winston-Salem Dash, march on the field in a parade, camp out right in the outfield of Harry Grove Stadium, and enjoy a special fireworks display (sponsored by the U.S. Army). Contact Ron Cromwell at joinpack883@yahoo.com by June 4th if you are interested in going. See flyer for more details on food plans and sleepover rules. This event is open to the entire family.